UNITED NATIONS, November 2, updated -- With Portugal taking over the Security Council presidency for November, their focus is on working methods, training incoming elected members, and pushing Portuguese as a seventh UN language. 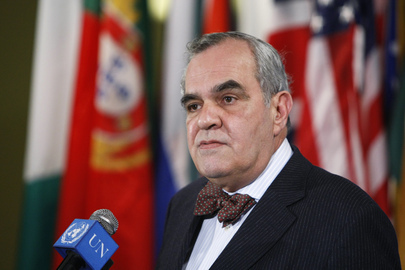 In his ten months on the Council, Portugal's Jose Filipe Moraes Cabral has stood out from his colleague in a commitment to the primacy of the General Assembly, most recently by refusing to show up for the Security Council's meeting on Yemen held the same afternoon as the General Assembly voted on electing five new Council members. Now the five elected are being brought in, as a form of training, into Council consultations. Togo comes in first, since it will take the presidency in early 2012, as the alphabet turns. Azerbaijan's Permanent Representative told Inner City Press he is returning home and so will start after the other Permanent Representatives, who attend the so-called "Finnish workshop" on November 17-18 then start watching closed door consultations. Since Finland is running next October, against Australia and Luxembourg, for a 2013-14 seat, some wonder if they can still run the Finnish workshop, or it is gives them a head-start. Of those joining the Council, Pakistan, Azerbaijan and Morocco are viewed as solid votes for Palestinian membership in the UN. Guatemala took a reservation from a Group of 77 position to this effect, but most recently voted "yes" for Palestine to join UNESCO. So it remains possible that Palestine's vote count goes up in November. But is it to nine or merely eight positive votes? Click here for Press review of Cabral's first nine SC months. Cabral's press conference on his program of work for the month, originally scheduled for the normal midday time, was moved back until after deadline and business hours at 6:15 pm. But the one-page Program of Work has emerged and reflects, among other things, a November 9 meeting on protection of civilians at which Portugal's president will attend, and an end of the month debate on working methods. On November 21, Yemen is on the agenda, by name. Nobel Peace Prize winner Tawakkul Karman, when the Council passed its resolution on Yemen, said she would stay in New York until the Council referred Saleh to the International Criminal Court and froze his assets. Since then, she told Inner City Press she was going to meet with Hillary Clinton. What will happen November 21? Another US connection is on November 14, when the Lord's Resistance Army will be considered. While we publish in full the plea for attack helicopters, the question of the day is how or whether these US "analysts" in countries which are members of the International Criminal Court are somehow exempt from the ICC. Perhaps this and other questions will be answered on November 14, or at least during the Portuguese presidency of the Security Council. Update of 7 pm -- Press questions submitted during Cabral's briefing to the Mission's spokesman by e-mail and text message were not asked. This would be a working methods improvement at the UN -- even the IMF does it -- on which we hope to have more: watch this site.